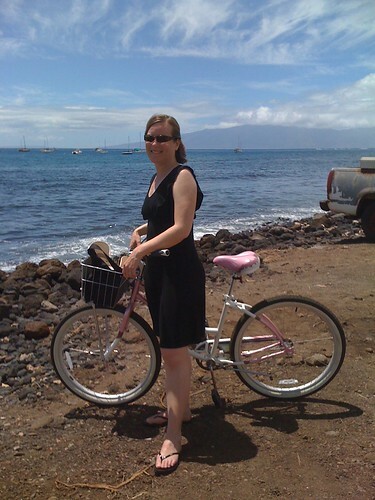 Vélo Vogue: Jen Ken in Maui! I like your bicycle! I should get one. Do the environment some good and lose calories while helping! Sounds great! I think that one is a Townie Cruiser! Well then, I should purchase a Townie Cruiser! It's a much better way to appreciate the surroundings anyhow. I'll be the only one in L.A. with a Townie Cruiser. I'm gonna affix a BMW emblem on it. lol. Just kidding! Toni - unfortunately Gab has got a Townie Cruiser and lives in LA (see yesterday's post)! You two can go biking together! Send us a pic when you get your bike! I shall check that out!